This recipe is courtesy of Putien Restaurant. The Tea Leaf Prawns (part of their Spring Menu this year) are infused just nicely with a gentle tea aroma. Looks simple enough to replicate at home, but I still envy the chef who has a high-BTU gas burner to flash-fry the prawns with. 1. Bring water to a boil and pour over the Longjing tea leaves. Let tea steep for 5 mins and strain. 2. Rinse prawns under running water, pat dry with paper towels. Add Longjing tea and marinate for 2 mins. Drain prawns and set aside. 3. Heat oil in a hot wok to 220 degrees C, add prawns and deep-fry for 30 seconds or till the shells are crisp. 4. Remove prawns from wok and drain, set aside. 5. Prepare sauce: in a small bowl, mix all sauce ingredients and set aside. 6. Drain the wok and return the wok to the heat. Add sauce and bring to a boil. Add the prawns and quickly stir-fry until the prawns are evenly coated. 7. 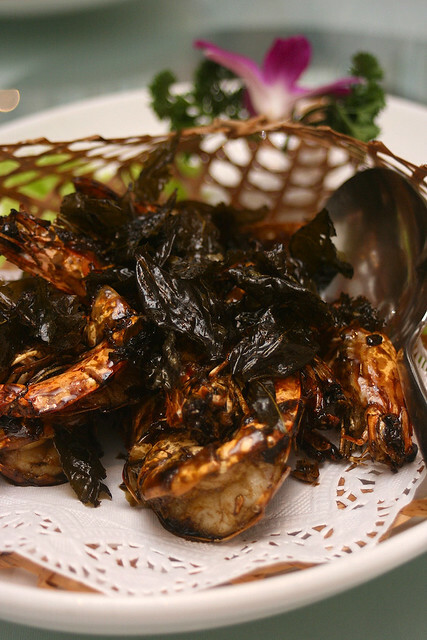 Place the prawns on a serving plate, garnish with the crisp tea leaves and serve immediately. Garrett Popcorn Now at Parkway Parade! Pizza Hut Revamps Menu for 30th Anniversary! Finally a Facebook page for Camemberu! New! Clusterfluff from Ben & Jerry's!